I had a need some years ago to make several copies of the floppy discs we were using to distribute our software on at the time..... so I make this! Not too difficult at all. 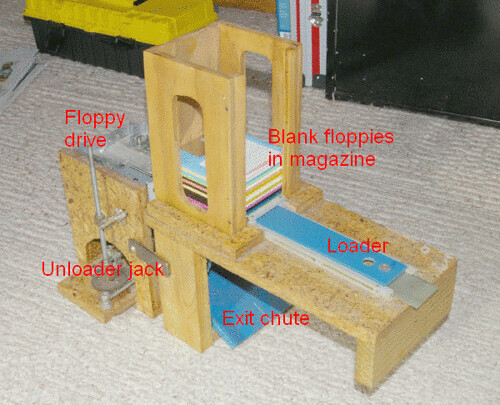 Blank floppies were placed in the hopper and the loading mechanism pushed them into the floppy disk drive. 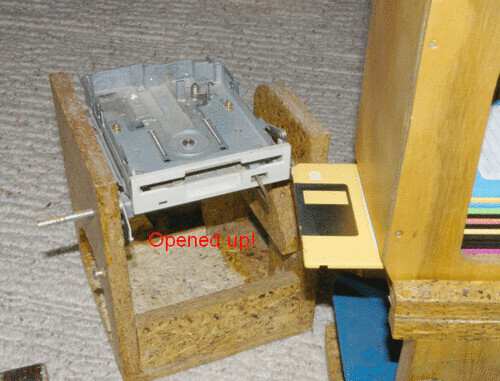 When the copy was complete the unloading jack lifted up the floppy drive which activated a push rod connected to the floppy eject mechanism to allow the floppy to drop out via the exit chute. It was all fully automatic with only two control lines from the RS232 port of the computer and of course the cables required to operate the floppy drive. 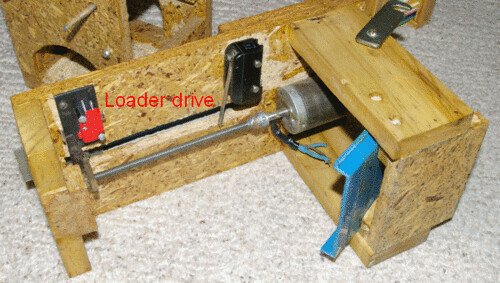 This is the loader motor which is direct connected to a threaded rod with a nut that is fixed to a plastic slide. When the computer set the control line to load the motor would run until stopped by a limit switch. Resetting the control line allowed the motor to run in the other direction until stopped by the other limit switch. 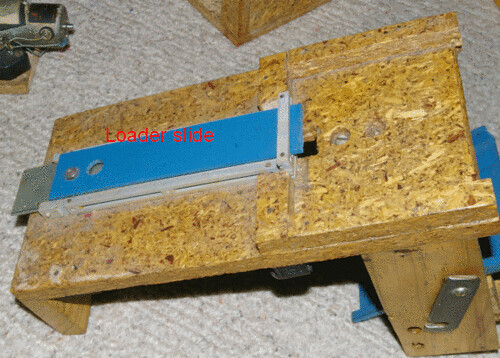 This is the plastic loader slide which pushed the floppy disc which was at the bottom of the hopper into the floppy drive. I have opened the machine up to show a floppy emerging from the hopper and how it would go into the drive. 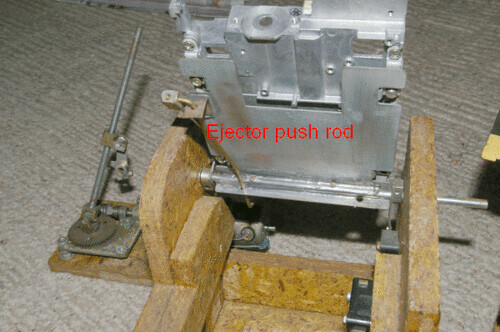 This is the unloader jack which was connected to a pivot bar supporting the floppy drive, when the unloader run it would tilt the floppy drive down which at the same time operated a push rod to trigger the eject mechanism. 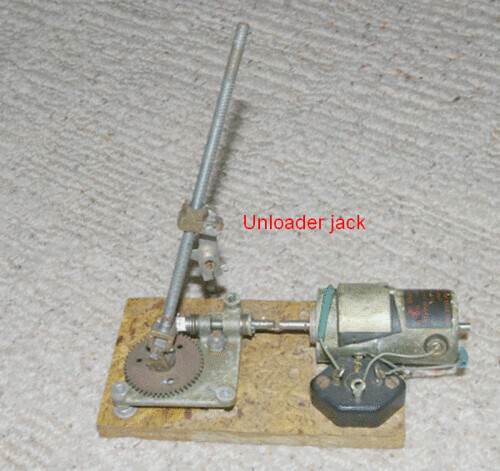 The first picture shows the jack in its operating position. The rectifier is connected to the field windings of this universal type motor and is a way of being able to reverse the motor by reversing polarity. Like the loader this motor was controlled by limit switches activated by movement of the floppy drive. Here is the floppy drive tilted down by the unloader and the push rod in position to activate the ejector. That is a true Heath Robinson machine, or do you have another name that you use underneath. If there is a mechanical problem to be solved, there is always someone with a gadget or widget who will come along cure the problem. It is such a shame that it is now redundant because of advances in media technology. But I am sure you can recycle it into another energy form, to help keep you warm in the winter. Aren't wood burning stoves wonderful? Great machine, that about 20 years ago was just the cats meow. Now you just have to make a few modifications so it will use DVD's. Actually Don it was about 20 years ago that I made it! Bogs, I have a whole book of your Mr Robinson's designs and I find them most ingenious so I am not offended by your comments! However, what better design could you have arrived at to meet a temporary need to copy a few hundred floppy discs eh? Meanwhile, now that I have climbed up to the top shelf to show it to you I may just modify it a little for the purpose of pushing slices of cheese into what you call 'sarnies'. Grab a yob off the street, bung him a few squid, and let him carry on swapping discs over. I know it might be at the limit of his brain capacitity, and liable to failure after a couple of minutes, but all avenues must be explored. But I do realise that gadgets do need to be made to circumvent problems that occur. BTW, the Heath Robinson bit wasn't used as an insult, but a compliment. Over here, anything that fulfills a need and is made up of bits and pieces is much admired (eccentric Englishmen and all that). The more pieces, gizmos and twirly bits, the better. Re Heath Robinson, we had a related concept in the place I used to work called the "HBS" where HBS stood for "hare brained scheme", someone would dream up some really weird way of doing something then we would all work on it and quite often find some useful morsel of inventivness we could use. I would just like to correct you on an English language terminology. If you were talking to a southerner (Watford gap and down) then SARNIE is the correct term, above that dividing line, BUTTIES are usually eaten, but of course, many dialects reside here, and they have all sorts of wierd and wonderful names for the lowly sandwich. As for the Welsh and Scots and Irish, I have no idea, they are most probably still eating each other. Point taken John, it is all basic kai to me. Bechdan in this part of the word. I'd like to join in the conversaion but haven't the foggiest what you guys are talking about. Somehow we went from some kind of wood do-hickie to some kind of sandwich. Oh I get it. It's a wooden sandwich maker, right? That is crazy but cool!